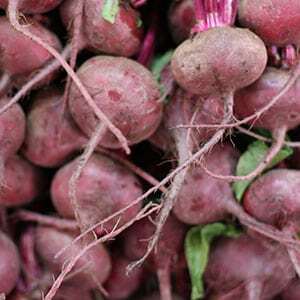 Like all root vegetables Beetroot are best grown from seed rather than seedlings, they simply do not like to be transplanted as it disturbs the tap root. Growing Beetroot plants from seed is actually fairly easy. In warmer areas beetroot can be grown almost all year found, although it is best to avoid the rainy season on the tropics. As we move to cooler areas the best time to plant beetroot is around September. You will find sowing advice for different types for different climate zones on the packets of seed. 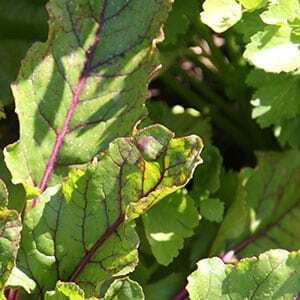 Grow Beetroot in a position with full sun to part shade. Baby beetroot is treated the same way. Plant beetroot after the danger of frost has passed and sow in batches 2-3 weeks apart to maintain a steady supply rather than a glut, thin seedlings after about 2-3 weeks. Seed is sown in rows and thinned after germination. Fertilise with a liquid seaweed based fertiliser as well as by digging in well rotted manure a few weeks before planting. Water well but do not allow the soil to get to wet, raised garden beds are great foe vegetables as they provide good drainage. Beetroot plants are relatively pest free, just don’t over water…. Warm Climates – Any time, however not in the wet season. Brisbane and further north. Perth – Year round but best in autumn and spring. Can you grow Beetroot in Containers? When to pick Beetroot, our main advice hear is not to let them get to big (they get a little tough) so as a guide, harvest beetroot 50 to 80 days after sowing. Remember to sow sequentially, every 3 -4 weeks. The actual time from seed to harvest does depends on variety. If unsure start harvesting at 50 days, pull a bulb and check for size. If its looking good, you can either harvest the whole lot, or pull up every second or third bulb and leave the other for another 10 days maybe some for 20 days extra. Beetroot varieties to grow in the home garden include : ‘Boltardy’, ‘Forono’, ‘Moulin Rouge’ and others. I was brought up on boiled beetroot and canned beetroot. The boiled stuff was just terrible, the canned variety was edible, but very sweet. As a teenager I was introduced to pickled beetroot, this still did nothing for me. Eventually I discovered the perfect, and easy way to cook beetroot, and it is so simple, great flavour, good texture and no additives at all. All you need is some fresh beetroot, make sure it is nor soft, and is not wrinkled. For medium sized beets cook for 1.5 hours. After this they need to cool a little and then be peeled. Uses a potato peeler, or a knife to peel the cooked beets. They are now ready to serve, great in salads. Where to Buy Beetroot Seed.